This page provides you with Digital Marketing resume samples that you can use for inspiration in writing your own resume, or for creating one through our easy-to-use resume builder. Below you'll find our how-to section that will guide you through each section of a Digital marketing resume. Digital marketing is one of the most dynamic and competitive career fields. Marketers looking to work in this field will need a resume that stands out from the competition, and our digital marketing resume sample will help. Employers want a resume that showcases experience and creativity - whether you're new to the industry or a seasoned veteran. It's a fight for every position, and a professional resume will help set you apart from the competition. We've created this resource to help you create a successful resume, including everything we know to help you write an excellent digital marketing resume. How to Write a Digital Marketing Resume? A digital marketer has two main issues: competition and how generic their resume might sound. That’s correct. You could say you have e-commerce experience or you have known social media for a while, but your resume will probably go straight to the bin! Let’s start by being as specific as possible about your position: what do you offer? What specialties have you developed over the last couple of years? What have you excelled in? Can you show any result? If you can’t get over these initial questions, well it’s going to be tough for you. But if you have actually been able to answer them, you are up for a fantastic resume! Display your impressive level of professionalism in the structure of the resume. Leave no room for haphazard organisations. Let every single detail mean something. In picking a format or layout, keep it professional and simple. Let every section of the resume be clearly defined. Any font which you shall be using should also be very clear. Don’t go for beauty and sacrifice clarity. No recruiter would want to squint and strain his eyes when going through your resume. Making use of a clear resume makes it very easy for them to pick the key parts of your resume. Let the headers of each section be clearly written and let the sections the properly spaced. This would let the recruiter easily run through your resume. And last but not least, you are a digital marketer: MS Word is a no-no for you, make sure you save your resume as a .pdf file! Let your talents as a digital marketing expert shine through as this is what the employer is looking for! Include any previous experience about digital marketing. Be like every other applicant – offer the same generic answers to their questions. Try to be funny on your resume – employers don’t like it. Clearly state any promotions you received in your previous employment. Need more tips on writing an efficient work experience section for a great Digital Marketer? Check out our detailed resume guide. Every employer always looks forward to this section. Yes, you are a digital marketer but you have surely had training. The skill didn’t just develop overnight. It took long years of training. This section is where you talk about your training and the different types of qualifications which you have. You can also state the duration which you spent at different schools or different institutions. If you have also been a part of online digital marketing courses, seminars or conferences, you can include them as a part of education. These are what your recruiter wants to see. Another way to sell you to employers is through certifications. Certifications from external sources such as a professional exam make you different from every other applicant. It is this type of different that recruiters are interested in. If you haven’t yet, have a look at getting it through the Google Analytics Academy, the Bing Ads or Hubspot Certification or, last but not least, the Hootsuite University. Employers do not want square pegs in round holes. They want people who are the perfect fit. Only your skills would reveal this to your employer. As a digital marketer, you would need certain skill such as computer literacy. If you include skills which are synonymous to a salesman, you may end up discouraging your employers. For instance, digital marketers absolutely have to have a great knowledge and understanding of the internet, computers and how SEO works. In the marketing world, these three components are the crucial factors and most marketers use them at some stage in their work. It can be wise to consider a cover letter with your resume as it often offers an advantage. Follow our tips here. Here are additional tips from us to help you out during your resume construction. DO (make yourself look great) - Be honest. - Be truthful no matter how much experience you lack. - Show your advance through the ranks. - Include no more than two references. DON’T (embarrass yourself) - Give out old or outdated information. - Unprofessional tones are a turn-off. - Stick to one font or letter design. - Unless you absolutely have to, don’t offer a link to your social media page. 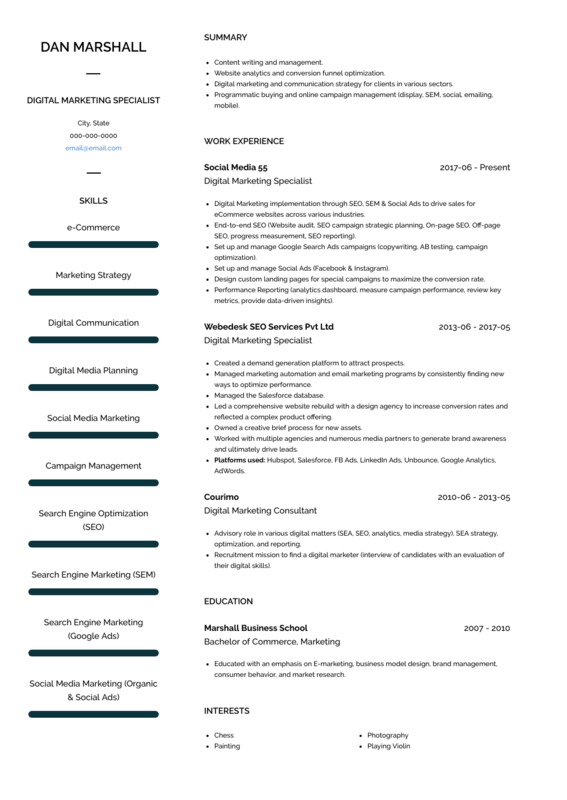 If a standout Digital Marketing Resume sample is not enough, why don’t you check out one of the most efficient Digital Marketing resume templates here : many professionals like you have successfully used it to take their career to the next level.